Custom Cakes provides a personal and bespoke service, ensuring you get a cake that truly fits you whatever your style may be. Contact me for free quotations and design service. I make the cutest wedding cake toppers made to look like you for your special day.They are non edible and will last forever. You can have any theme you like, I work to your requirements. Nothing is impossible. 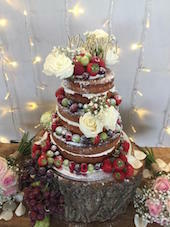 Wedding Cakes by April Cottage is a home based business offering that personal and relaxed approach to creating that perfect cake for your special day. Each design is based round your likes and needs and even if you do like an existing design I like to make slight alterations so the design becomes uniquely yours. After all you want that perfect design to look back on in years to come as it will no doubt be the most photographed shot on the day by your guests........your cake cutting shot! I offer complimentary taster boxes with every booking or these can be purchased separately, these are available on specific dates throughout the year. Do you want your cake decoration to be a conversation starter? At Allsorts Clay, we design and create bespoke and fully personalised clay cake toppers for any occasion; capturing your special day as a forever keepsake. Nothing is a challenge so please get in touch and create your perfect topper! We are a wedding cake shop based in Lanark in South Lanarkshire. We deliver throughout Scotland. All of our cakes are handmade in our shop using the finest quality ingredients. 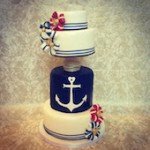 We cater for all styles of wedding cake and offer a design and consultation service. Appointments can be arranged for consultation however we also welcome drop-in enquiries. We have a large selection of display cakes and everyone who books a standard wedding cake with Jappacakes gets to sample all 10 of our delicious wedding cake flavours. We also have a range of 3 tier wedding cakes for £195, for those who are on a budget but still want a high quality cake. Vivacious Cakes will create the perfect centre piece for your day with flavours and design to match your own vision, care and dedication for your big day! 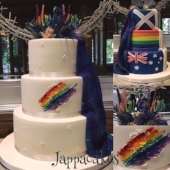 Kirsty is a multiple Scottish Wedding Cake award nominee, being a finalist in the Confetti Wedding Awards 2016, and Scottish Wedding Awards both 2017 and 2018. She also won Perth’s very own Cake Fest! Having had a consultation with you, they produce cakes that are bespoke and personal to the recipient, with close attention to detail, they always produce cakes that are original and stunning! Designing and creating beautiful, bespoke wedding cakes across Derbyshire and Leicestershire, I will work with you to make your cake dream a reality for your special occasion. I believe that every cake should look and taste amazing and so, using the finest ingredients, everything is freshly baked in my country kitchen. My aim is to work with you to transform your vision of your dream cake into a delicious, bespoke cake that will form a special part of your big day. Our cupcakes are offering a unique, truly delicious alternative to the classic wedding cake or gift at very affordable prices. We are always open to new ideas and inspiration. 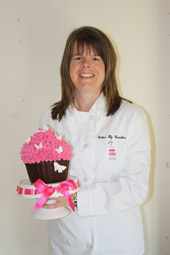 If you have something in mind please get in touch and we will do all we can to create your perfect cupcake. With over 40 years experience as a artist she can sculpt a highly detailed couple, single figurines, pet or vehicle in polymer clay, almost anything is possible. Delivering nationwide. Or replace your cake with a huge, attention grabbing sugar centre piece for any event see her wacky sculptures, available no where else in the world. Cakes by Caroline specialises in delicious cakes designed to make your mouth water. 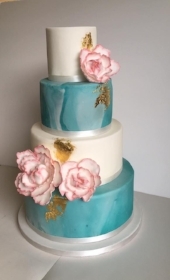 Whether your cake is a four tiered wedding cake with a mountain of snowy frosting, a whimsical heart shaped chocolate cake or that special cake to match your colour scheme, Caroline’s creation will reflect the style and essence of that special day and it will taste fabulous too! 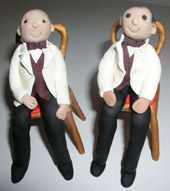 Hand crafted ceramic cake toppers, made to match you on your special day. Pets, hobbies, uniforms and more can be included. 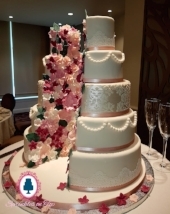 Cakes by Beth specialise in bespoke, contemporary wedding cakes, edible favours and dessert tables, creating that delicious wow factor for your special day. Everything is hand-crafted from scratch using the finest quality local, seasonal and Fairtrade ingredients. Our service includes a complimentary design and tasting consultation, plus our quoted price includes delivery and set up within 50 miles of our kitchen in Manchester.